In 2008, a dream was sparked and imaginations ignited with a simple 6th birthday gift, a trip to see Cirque du Soleil’s performance of Kooza. The performance was held under the grand Chapiteau where every seat gives you that breathtaking feeling that everyone is in the front row. As the performers twisted and turned, balanced and contorted, a flexible young gymnast saw something that night that most only can envision in their dreams. This was her future. She very much needed to be a part of this very fluid, artistic and ethereal kind of life. A dream was born. As parents, her father and I kind of silently chuckled at this preposterous notion. “That’s adorable you silly girl” we secretly said to each other. As the days passed and the dream silently continued to grow, she would practice for many days trying to perfect a few moves that the contortionists did in the show. While we were amazed and captivated by her flexibility and desire to “run away with the circus”, we did nothing. Fast forward 3 1/2 years later and a move to a small mountain town 3000 miles from our home in a largely populated metropolis, she spoke again of this big top dream. Within a week of reigniting the conversation, we happened to be channel surfing and by what seemed to be the world demanding we, as parents, listen to our child, the remote strangely stopped on PBS. A documentary style show from the creators of Circus Smirkus was in the first couple of minutes of an hour long program. We all stopped what we were doing to watch. Say what? There really is a place out there in the circus world for youth? Oh wait, there are MANY youth circus programs we learned all over the country, including where we had just moved from. Silly parents, why had we not listened? After watching the documentary, we piled around the computer to check out the Circus Smirkus organization. Again, instantly, we watched our 9 year old daughter’s eyes grow with delight and her heart swell with a passion for this amazing art form. After checking out the company and realizing that this truly was a legit and passionate non profit that dedicated itself to enriching the lives of young people like our daughter; as parents, we were now buying in to what Hannah was selling. At this point it is now the summer of 2011, Hannah is a competitive Level 5 gymnast with ZERO circus training and/or experience. After watching the video, we asked one of her very adventurous coaches if he would train her in the circus arts. He also had zero training or experience. Together, we purchased “how-to” manuals and grassroots training began. 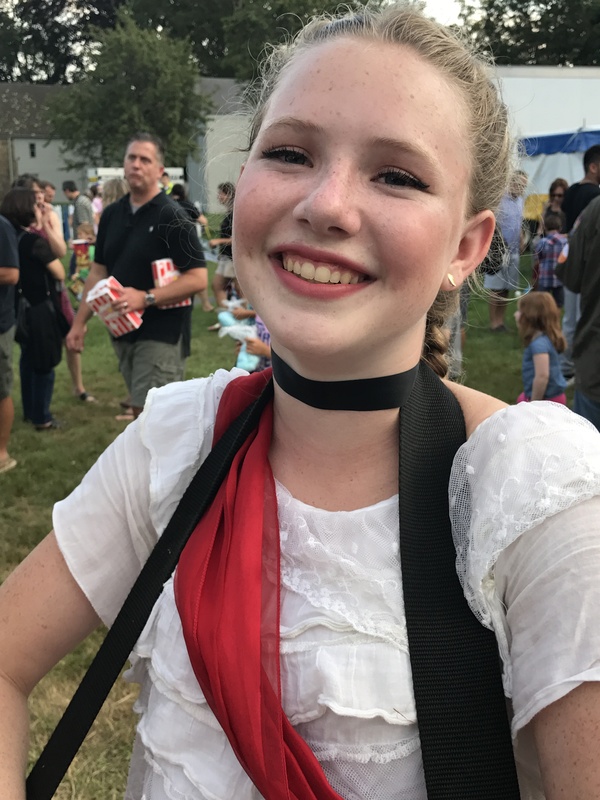 At Smirkus, they do have summer camp programs but she had her eye on their golden ticket…..their summer youth troupe for kids ages 10-18. Auditions are done in a multi level process, you must submit a 5-6 minute video introducing yourself, showing off your skills and then include a short piece of your performance art. If Smirkus likes what they see, you get an invitation to live auditions so they can see you in person to make sure you’re the real deal. Hundreds of kids send in video auditions, however only approx. 40 kids make it to the live auditions, and from there approx. 28-30 kids make it on to their 10 week summer traveling circus tour. Again, with zero experience, we put together the best audition video tape we could to ensure that they could see her raw determination. Instead of aerial silks, we only had climbing rope. Instead of a trapeze, we had a gymnastics high bar. We faked it til we made it and what do you know? They invited her to live tour auditions. This began our twice a year journey from SW Virginia to Vermont to fulfill these circus aspirations. Year one, no to summer tour. Invitation to advanced circus camp. Year two. Decided to try the National Cirque School summer camp in Montreal instead. Year three. Smirkus again said no at live auditions. Year four. Smirkus said no at the live auditions. But something was different this year, 2016. Live auditions are held in January, notifications are sent out the following week. When the answer was once again no, honestly, she did shed a tear or two but only for a moment. No matter what the results, her positive attitude and fierce determination did not let her down. She was going back next year for a 4th try! So proud of our girl. In mid March, just a couple weeks back, the phone rang and a Vermont number showed up on caller ID. Was it another telemarketer? I almost didn’t answer the phone and it certainly didn’t cross my mind that it might be Smirkus calling. Much to my chagrin, I answered prepared to hang up on the relentless marketing calls we receive. The voice on the other end however, was much too familiar, I had heard this voice many times over the years, it was the Director of the Circus Smirkus Summer Tour! Turns out that a casting change was needed and Hannah was on the first alternate list. She finally made it. She turned those dreams into realities and all those no’s into one great big YES. Check out the amazing award-winning youth circus organization provided by Circus Smirkus HERE. Love, love, love the support you have given Hannah! It’s all about the dreams, you know! So happy for all of you! I look forward to your posts, dear Hannah! She’s quite fortunate to have such a supportive family. Good for her.